I recently made the recipe for the Healthy Holiday Company’s Coming Cooking class and it was a hit. Easy to make, eat, and share. Great for a Christmas gift or snack. Merry Christmas! Preheat oven to 300 degrees. Spray a parchment or aluminum foil lined baking sheet with cooking spray. Place popcorn and hazelnuts on prepared pan. Whisk together chocolate hazelnut spread and honey in a microwave safe bowl. Microwave for 1 minute or until melted and smooth. 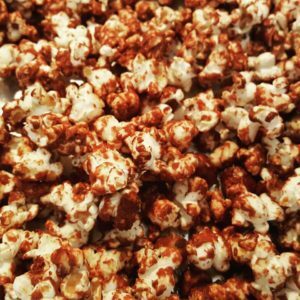 Drizzle hazelnut mixture over popcorn mixture and toss gently to coat. Bake for 14 minutes, stirring twice. Cool popcorn completely before serving.